>Fujiyama: 1466 First ave. NY NY. When you walk into a restaurant that is empty except for one other person and the waitress, you may worry a little. I wasn’t concerned because a) It was 3:30 on a rainy weekday and b )I’ve ordered in delivery from here a bunch of times and have always been happy with it. I think they mostly do their business via take-out and delivery since every time I walk by you can practically hear crickets chirping. 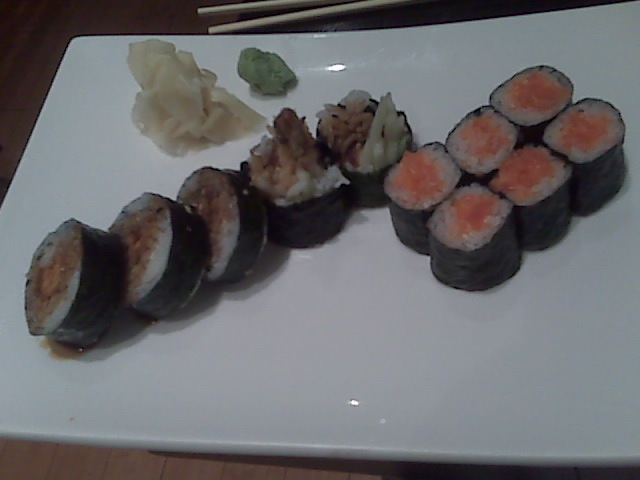 Since I’d never actually gone in to eat, I picked it as a place to meet a fellow sushi-loving friend. This particular friend and I almost exclusively pick sushi places to meet, and we almost always order the maki roll lunch special. We’ve now been to about 10 different restaurants like this and Fujiyama did not disappoint. It’s the standard lunch special: 2 maki rolls, salad and miso soup for around $10. 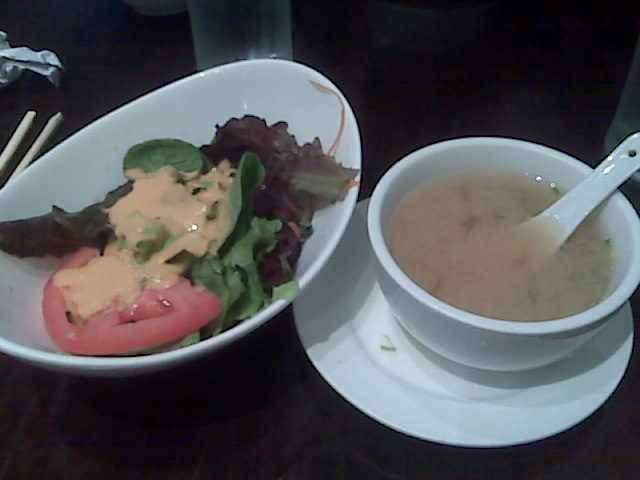 The salad was made with mesclun lettuce (yay for NOT being iceberg) and the dressing was exactly what it should be. The soup was piping hot and belly-warming. I ordered spicy salmon and shrimp tempura for my rolls, and asked for seaweed on the outside, a request that was granted without batting an eye as some places do. Incidentally, when did inside-out become the norm, and why? I love the snap of seaweed and you really lose that when rice is outside. Anyway, everything was fresh, prepared well and served quickly. Fujiyama is reliable and consistent if not earth-shatteringly original and I will definitely continue to order in from there. I may visit again, considering that it’s a 5 minute walk from my apartment and I KNOW I will always get a table without waiting.